Throughout the run of Matthew Bourne's Cinderella, Sadler's Wells will be hosting pre-theatre supper on the Mezzanine Level, offering a choice of individual platters and desserts. Bookings available from 6pm Tuesday to Saturday for 7.30pm performances and from 5.30pm on Sundays for 7pm performances. Supper at Sadler’s is only available for evening shows. Menu choices must be made at the point of booking. 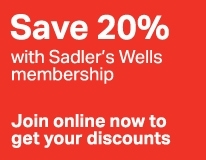 Standard Sadler’s Wells T&Cs also apply. Save time and pre-order your interval drinks via our new Sadler's Wells Bars app! Download the free app via the App Store and Google Play and order your drinks at any time, even before you walk through our doors. You can also order your interval drinks online. You can order drinks until the start time of the performance. Once your order is placed you will receive a confirmation of your order and where you can collect it during the interval. This event is suitable for those who are blind or partially sighted.